Top Quality, Unique Dual Compressor! 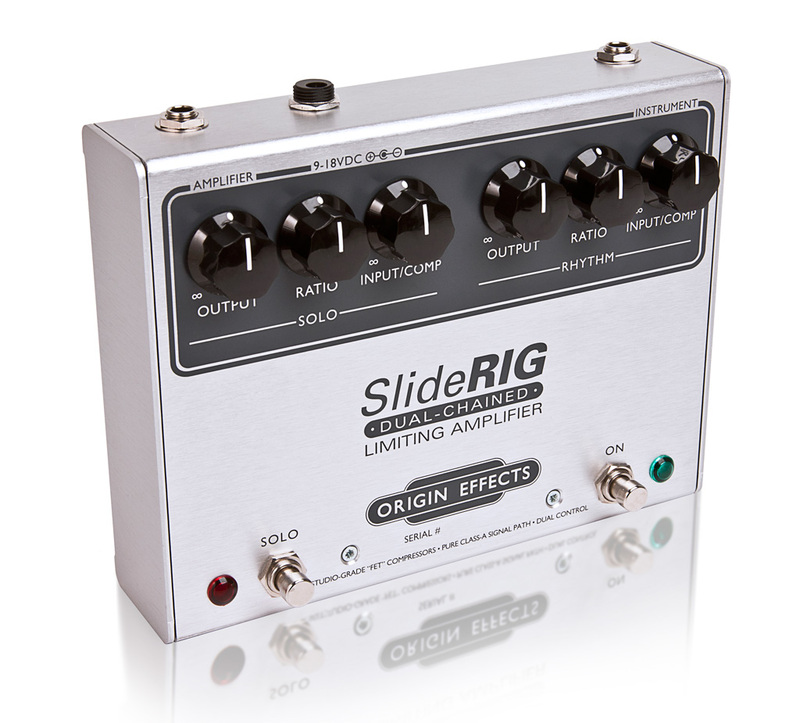 SlideRig, Compressor/Sustainer for Guitar from Origin Effects. Origin Effects has developed the SlideRig dual compressor after the Urei 1176, most notably as it was incorporated on the Little Feat studio recording of "Dixie Chicken". The tone and attack that Lowell George displayed on Dixie Chicken is legendary and has influenced several slide artists including Bonnie Raitt. 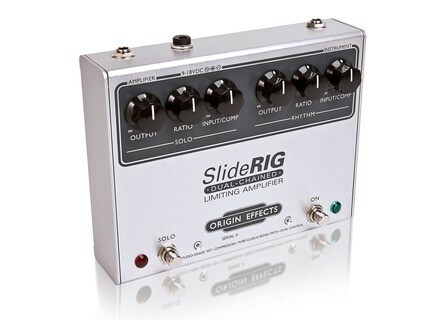 The SlideRig incorporates dual channels with individual Output, Ratio, and Input/Comp controls, pure Class A signal path, selectable buffered or true-bypass switching, internally adjustable attack and release controls, a signal preamp, and 9-18v operation, all housed in a durable (albeit large) stainless steel enclosure. When I was on tour with Little Feat in London this past summer, Paul gave me a box with the Origin Effects logo on it, and said "This is a new compressor this guy made, I want to put this on my pedalboard and try it out when we get back to the states." So I packed it into the tech box and the London show went great, and we flew home. When we began a lengthy run in Texas, I brought out the Slide-Rig and replaced the two individual compressors (A boutique model and a standard Boss CS-2) on Paul's pedalboard with it. The Setup is simple enough. There are 6 controls, three for each "channel" of the compressor. Two footswitches engage one side of the SlideRig and then the other. Here, depending on how you set the controls, you can go from either the pleasant dual compression effect found in classic Feat songs, or set them so that the 2nd compressor acts like a boost for soloing. Either way, you can't go wrong. The pots are very low friction, so care must be taken to mark your settings. Even minor handling of the SlideRig can cause the knob positions to shift. One, The SlideRig was far smoother in its response and sound than the two individual compressor setup. Two, the "pumping" effect that is a common complaint of compressors, did not exist with the SlideRig. Paul uses the SlideRig through a Rivera S120 Tube amp that's running into a Marshall 1960A Cab loaded with Celestion Vintage 30's. The SlideRig does a beautiful job of working with the Rivera S120 to get a very smooth, tube-like compression. The Origin Effects SlideRig is a very unique and well-designed effect for those who love studio-grade compression. The only cons to this pedal would be the size (it measures something like 8 inches wide) and the easily-disturbed control knobs. That being said, the SlideRIG is relatively the same or smaller in dimension than a similar setup using two individual compressors in series, so it's likely not an issue. Aside from that, it's just about the best pedal compressor one could hope to find on the market. In my opinion it's light years ahead of Boss, MXR, and even Keeley.